"It's the end of the season as we know it, and I feel fine"
Now that the dust has settled on the season, with MUFC Ltd avoiding the drop on the last day despite a 3-2 home defeat to a mid-table, nothing-to-play-for Dartford side, it's time for me to reflect. 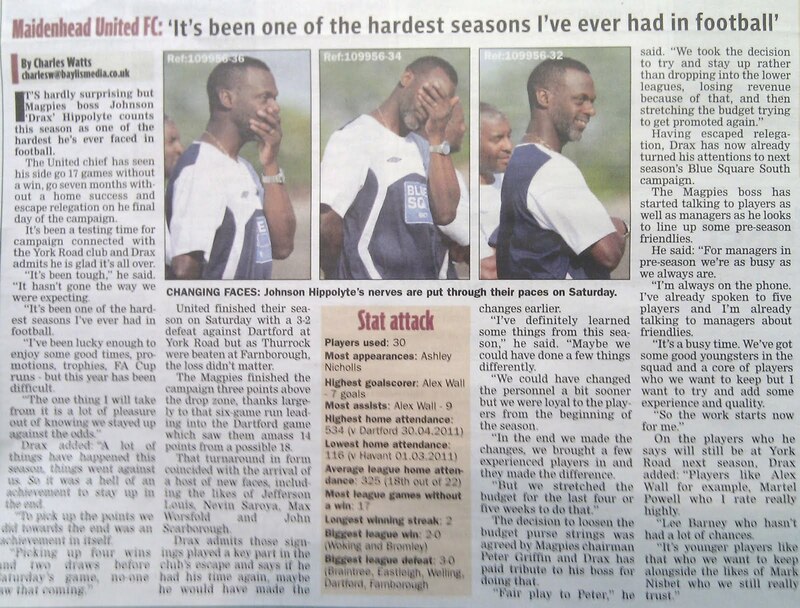 Specifically, time for me to reflect on the immediate reflections of Johnson Hippolyte, Maidenhead United manager, and Charles Watts, Maidenhead Advertiser sports reporter, which appeared in the paper on 5th May. 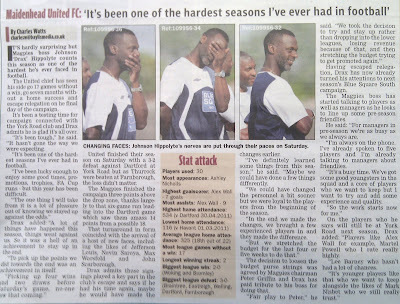 True to form, under a headline of "Relief for Magpies boss", Hippolyte is quoted as saying that "A lot of things have happened this season, things went against us. 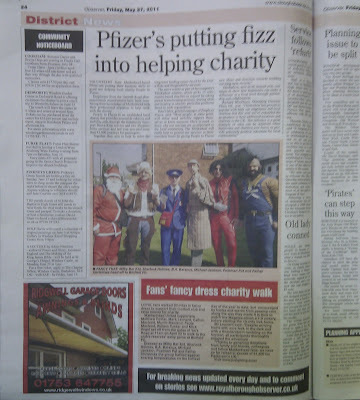 So it was a hell of an achievement to stay up in the end"
Firstly, it's laughable to view staying up as an achievement. Laughable. Even when considering that we were virtually dead and buried after the defeat at Lewes at the beginning of April. As for things going against us, it seems to me that we got lucky more often than not. Recent examples include Matt Bodkin's injury at Thurrock (when they were dominating), the Ref in that game missing a blatant handball in our box after Max Worsfold's wonder goal, and then the linesman at Staines missing an obvious offside to allow Ashley Smith's last-gasp winner. 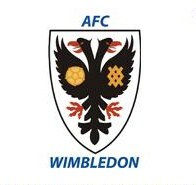 Furthermore, as Watts - in his article entitled "Shake-up needed to avoid similar struggles" - points out, it was Steve Williams' last-minute penalty save at Basingstoke on 5th April that helped kick-start the run of form - four wins and two draws – which enabled us to enter the last-day with our destiny in our own hands. The match at Basingstoke, which we won 4-3 (our first three points of 2011) was a re-scheduled fixture, after the original game was abandoned relatively late-on, with the score at 0-0, due to an injury to the home side's keeper. So much for things going against us. Watts goes on to state that "the budget was stretched to bring them in (the likes of Nevin Saroya, Jon Scarborough, Jefferson Louis and Max Worsfold) and that won't continue next season"
Who says it (the budget being stretched) won't continue next season? I think you can count on one hand the number of months that the budget hasn't been 'stretched' since Hippolyte took over. The decision to loosen the budget purse strings was agreed by Magpies Chariman Peter Griffin and Drax has paid tribute to his boss for doing that. "Fair play to Peter", he said. “We took the decision to try and stay up rather than dropping down to the lower league, losing revenue because of that, and then stretching the budget trying to get promoted again"
Umm, why would you need to stretch the budget to try and get promoted again? And why not just set the budget and stick with it. If it isn't enough, and you go down (or stay down), then so be it. "We've got some good youngsters in the squad and a core group of players who we want to keep but I want to try and add some experience and quality"
This very same sentence could've been uttered last summer (and it probably was). How did that turn out? On the players who he says will still be at York Road next season, Drax added: "Players like Alex Wall, for example. Martel Powell, who I rate highly. Lee Barney, who hasn't had a lot of chances"
Why hasn't Lee Barney had a lot of chances? Anything to do with the budget being increased, seemingly on a whim, and the likes of Cliff Akurang, Jefferson Louis, Anthony Thomas, Craig Faulconbridge etc. being brought in? "It's been a painful campaign for the supporters and a summer of exciting activity could be just the tonic they need"
I, for one, am more interested in MUSA's plans (if they have any) re ground maintenance/improvement over the close season. How many will turn up for the Work Parties? Not many, I suspect. It's the age-old 'Supporters vs Spectators' debate. Much has been made of our average league attendance increasing by 5% but there is no word on the number of season ticket holders, which I suspect are falling. It seems to me as if the club have the same attitude to attendances as they do with the playing squad. Team struggling? Up the budget and sign better/more players. Crowds down? Have a discounted entry game. Short-term fixes. Dorchester Town was the latest game where discounted entry applied. As per usual, Maidenhead's performance in front of a larger home crowd left much to be desired (United conceded a second-half equaliser to the ten-men from Dorset). The season's two biggest attendances were 534 against Dartford on the final day (lost 3-2, after being 3-0 down) and 515 against Staines Town (two goals post 90th-minute gave the visitors a 3-2 win). I'd rather just 250 people in attendance - all of them genuinely giving a sh!t - than 500, 50% of whom couldn't really care less and only turned up because it's discounted entry. Results (and not just this season) might suggest that the players agree! Interestingly, it seems as if those who provided their names and address to get discounted entry at the Dorchester game received letters from MUFC Ltd, thanking them for their support. I can only imagine what the letters actually said ("Thanks for having a great affection for the club ... at least when it's only a fiver to get in"?!). The fact that letters were evidently sent to those with Dorset addresses, sums things up for me! A month ago tomorrow seven Maidenhead United fans walked well in excess of 17 miles - on the then hottest day of the year - to/ from York Road, Maidenhead, and Hill Farm Lane, Binfield, in order to attend the game between Binfield Reserves and Maidenhead United Reserves. 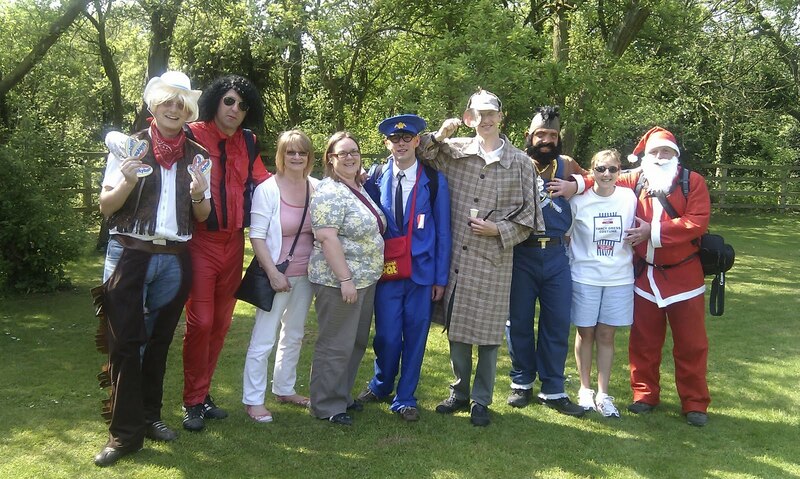 As this was the last away game of the season, tradition dictated that we went in Fancy Dress! We asked for sponsorship; all funds raised going directly to Parkinson's UK, a charity who for more than 40 years have been working to find a cure and improve life for everyone affected by Parkinson's. So far, over £1K has been donated (more than 200% of our original target) and I would like to take this opportunity to thank those who took part and everyone who has donated; from those at Binfield FC (who were very welcoming hosts on the day) to MUFC Ltd luminaries Johnson Hippolyte and Peter Griffin, plus countless others. Here's hoping the Fixture Computer Abacus is kind and Fancy Dresslemania XII takes place at somewhere like Truro or Weston-super-Mare. We won't be walking to either of those, though! FURTHER READING: "I don't like to talk about my charity work, mate"